Freezing Prepared Food from Restaurants. Question: I was wondering if I could freeze meals from a restaraunt for a few days. I would like to order a few days worth of meals at a time since they have a wonderful diet menu. Answer: Yes, you can freeze prepared food from restaurants. I would start by test freezing one serving for quality before buying a whole bunch. Make sure that the restaurant meals you indent to freeze are made of foods that can freeze well and read the part about foods that change textures when frozen too. 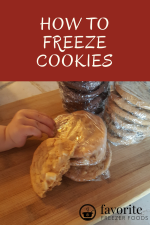 You'll also want to use proper freezer containers. If your food comes in a sturdy plastic or foil container that might work as long as there isn't much air in the package. You can always wrap aluminum foil over the top too, especially with foil containers with paper tops. And, since you're doing this for your diet I'd also suggest taking a good look at portion size before freezing. They might say that tray of lasagna feeds 6 but you might want it to be 8 or 10 single servings. It's much easier to divide food into single portions before freezing than afterward. You can reheat your prepared food in the oven, microwave or stovetop. Whichever is easiest and you have the time for. Question: Is it possible to freeze vegetables that have already been stir fried, so they can later be reheated in a microwave like a tv dinner? Yes, you could stir fry your vegetables and then freeze them to be reheated in the microwave. Stir frying still kills the enzymes that would cause them to over-ripen in the freezer. Remember that watery vegetables don't freeze well. You aren't likely to stir fry cucumbers, radishes or lettuce but cabbage and celery will be watery and not as good as fresh after they freeze. And I wouldn't do this with frozen vegetables either because they are already blanched, no need to cook them three times before dinner. You could fry up fresh onion, garlic, ginger, etc. let it cool and mix it with frozen vegetables then reheat the mixture in the microwave. Can Cranberry Sauce Be Frozen? Question: Can I freeze cranberry sauce? Answer: Heck yes, cranberry sauce freezes great! For larger batches you can freeze it in small plastic containers. Add plastic wrap over the top, against the cranberry sauce to help prevent freezer burn. Do not fill the container all the way to the top because it will expand some when it freezes, this is called leaving 'head room.' It'll be good for months. Another option is to freeze it in ice cub trays and then store the ice cubes in a plastic freezer bag. This method has more surface area and a higher chance of getting freezer burn so the cranberry sauce won't last as long, probably about 4-6 weeks. However, it makes for single portions that you can grab and thaw easily. It's still kind of soft when frozen. 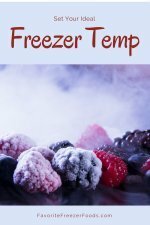 Thaw it in the fridge or heat on the stove for large portions. An ice cube or two can thaw on a plate on the counter while you're preparing the rest of your meal if you like it cold or zap it in the microwave if you want to heat it. Update: I've added a Cranberry Sauce Recipe for anyone who wants to make their own. Q:After i open a bottle of sauerkraut, can I freeze the left overs??? A:Yes, use a freezer container, like a freezer bag. You can also use an ice cube tray to freeze small portions. I don't think I've ever had revel bars but it looks like they'll freeze fine, most cookies and baked goods do. Would you mind sharing your recipe? If you are and your recipe is anything like my Grandma's than No, I wouldn't it won't freeze it, but that might just be because she added lots of the fruit syrup to hers. Her's was cool whip, cocount, canned fruit and marshmallows. It would weep after a few days in the fridge and I doubt it would thaw well if frozen. Do you have the time to test a single batch before you make a bunch for the whole family? I wish I could say for sure if it would work but I think it will depend on your recipe.